Zalisha Soya Bora are flash cards giving information on growing soybean. They were produced as part of the Scaling-up Improved Legume Technologies (SILT) program as part of the Legume Alliance campaign in Tanzania. They are designed to be used by extension workers carrying out training sessions. 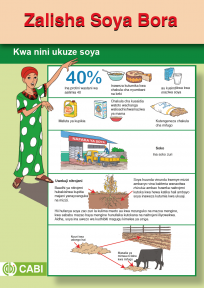 Zalisha Soya Bora is an A3 poster giving information on growing soybean. It was produced as part of the Scaling Up Improved Legume Technologies (SILT) program running the Legume Alliance campaign in Tanzania. Zalisha Soya Bora is a 12 page manual giving information on growing soybeans. It was produced as part of the Scaling Up Improved Legume Technologies (SILT) program running the Legume Alliance campaign in Tanzania.